A few months ago, I had the pleasure of reading Voyage to Magical North by Claire Fayers. Seriously folks, this book is bonkers. It is so funny, and magical, and it has piraña-like penguins. Because, after all, a voyage to someplace magical is never easy. Voyage to Magical North, the first in a series, hits shelves from Henry Holt Company on July 5, 2016, and I’m thrilled that Claire let me interview her and ask her whatever I wanted. Hooray, power! And without further adieu, Claire. 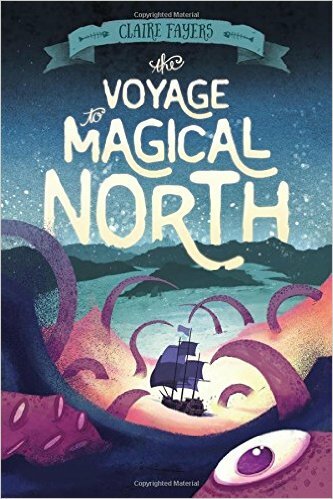 . .
Sarah: If you had to name any one book (okay, I’ll give you three) that inspired Voyage to Magical North, what would it/they be? Claire: When I was young, I loved stories of adventures and quests – everything from Jason and the Argonauts to Willard Price (Diving Adventure, Whale Adventure, African Adventure, you name it, he had an adventure for it.) The books had few girl characters, and if they did, the girls were usually chained to a rock awaiting rescue. So, naturally, I wanted to be a boy when I grew up because boys had all the adventures. The balance is shifting now, which is a good thing, because stories are for everyone so everyone should get the chance to be in them. I’ve always had a liking for fantasy, which was always very heroic and serious, until I discovered Terry Pratchett and I learned that fantasy could be told with humour, and you can get away with poking fun at all sorts of things if you do it in a made-up world. When I started writing Voyage to Magical North, I wanted to combine that sense of humour with the fun and excitement of the classic adventure stories I loved as a child. And still love, to be honest. So: Greek myths; Willard Price; Terry Pratchett. Read one of each and you too can have a weird imagination like mine. Sarah: What part of the book was the most fun to write? Claire: The start of chapter four where we meet the Onion was the first bit I ever wrote. I didn’t have the faintest idea how it was going to fit into the story (or even what the story was going to be) but I loved the idea of an adventuresome pirate crew and all the exaggerated stories that grew up around them. It makes me really happy when people read that bit and laugh. Sarah: At what point during writing did you want to throw your laptop out the window? Claire: [While writing] Marfak West. He’s one of my favourite characters. He’s frighteningly clever, cuttingly sarcastic and ruthlessly unscrupulous. He has an evil plan, of course – every evil genius must have a plan, but for the life of me I couldn’t work out what it was. Sarah: If you ended up at the Magical North, what would you want to see? Claire: Magical North is the third north pole, alongside geographical north and magnetic north. It’s a place so full of magic that anyone who stands there can see the whole world. I would like to see where my cat went when he disappeared for three and a half weeks. It is the worst feeling to lose a pet and have no idea where they are or what has happened to them. He eventually came home, five o’clock in the morning and very thin and dirty, so I don’t think he enjoyed his adventures. We’ve put a radio tracker on his collar now so we can find him if he wanders again, but I’d love to know where he was for those weeks. Sarah: What is your favorite place to write? I have an office at home. It’s got a proper leather-topped desk which I bought with my first advance cheque, an old armchair covered in cat hair, and bookshelves everywhere. Best of all, it’s got a door that opens onto the back garden. In the summer when the weather is good (it doesn’t happen that often in Wales!) I like to leave the door open so the cats can wander in and out, chase insects and occasionally crash into my legs. Sarah: What is the best book you’ve read this year? Claire: You’ve caught me on an even-numbered year, which is good because on odd years I re-read The Count of Monte Cristo, and any question about books will have me rambling forever about revenge, lost love and convoluted plotting. This year, though, it’s the year of the debut and here are three very funny middle grade books out soon. If you like Voyage to Magical North, you will love these. 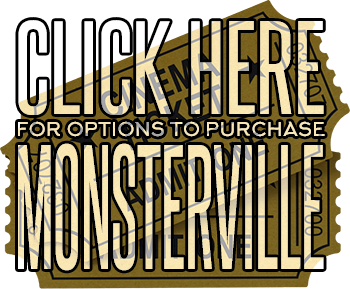 Monsterville by Sarah Schauerte. I’m sure Sarah won’t mind me recommending her book. It’s got monsters and lots of movie references and it’s really funny. Howard Wallace P.I. by Casey Lyall. Howard runs his own private detective business at school and has to solve a blackmail plot whilst dealing with school bullies, suspicious teachers and new girl, Ivy who wants to be his partner. Ministry of Suits by Paul Gamble. Mystery, adventure, pirates, dinosaurs, unicorns and outrageously bad jokes as two kids join the Ministry of Strange, Unusual and Impossible Things. Sarah: What do you hope kids get out of reading yours? Claire: When I started writing Voyage I just wanted to write something fun. I hope I’ve done that, but during the writing all these ideas about stories kept creeping in. How we tell stories about ourselves and other people. We cast some people as heroes, others as villains and the stories can grow and take on a life of their own. But when we really take time to listen to someone’s story and try to understand it, that’s how friendships begin. So, I hope you all have fun reading my book. I hope it makes you laugh now and then. And, when you’ve finished reading, I hope you’ll go out and make stories of your own. That’s all, folks! If Voyage to Magical North sounds like your cup of tea, you can order it here. Kirkus Reviews recently gave Voyage to Magical North a starred review, and other praise and accolades will surely follow shortly.